We controlled the terms of their Constitution, making sure it protected U.S. interests. In violation of international law, we forced Cuba, under military threat, to include clauses in their Constitution which would keep us in control of their island. These collective clauses made up the Platt Amendment. The amendment which allows us, to this day, to have the Guantanamo naval base/prison on their island. 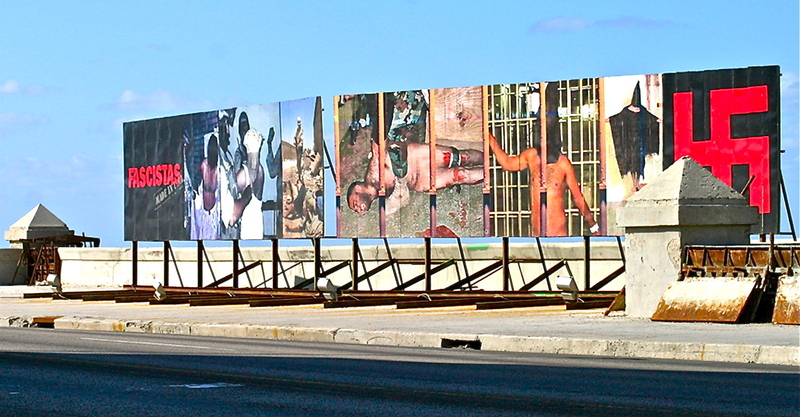 Billboard referencing Guantanamo prison & the U.S. torture of Arab prisoners. Translation: we can step in & squash anything Cubans want to do if it threatens U.S. interests. You know, like the shockingly awesome Constitution we’re “helping” oil-rich Iraq draw up under our “freedom” occupation right now. “Imperalismo yanqui!” someone in the Cuban group spat. Yankee imperialism? Huh? Yankee? Who’s a yankee? I just knew he wasn’t talking baseball. Whatever it was, judging by that Cuban’s tone, it didn’t sound well-loved. Victor said that after writing their Constitution, we held the first of many rigged elections in which we put an American-puppet president into power. Our first puppet, Thomas Estrada Palma, paved the way for decades of threatened or well-paid Cuban presidential puppets who allowed us to do whatever the hell we wanted in Cuba. In 1906, nationalist Cubans rose up in violent protest against America’s racist & imperialist actions in Cuba. Our American president was violently pissed about this. How dare those Cubans revolt against our democratic White supremacy. How dare they reject the white Cuban puppet-president we put into power on their island. After all we’d done for them. Ungrateful Brown bastards! In fact, Haiti’s successful revolution against slavery was still frighteningly fresh in the minds of our White supremacist government. Our biggest fear was that brown Cubans would band together & form a nationalist government that would inspire surrounding Brown islands to join forces, rise up, beat us down & kick us out of the Caribbean. In addition to the profits we were making from other Brown islands we’d colonized after kicking Spain out, we had more than $200 million worth of investments on Cuba — in sugar and tobacco, utility and mining companies, cattle ranching, transportation, and other Cuban geese laying golden eggs for us. The hell if we were going to allow Cubans to re-claim their profitable island, and in the process inspire other Brown islands to follow suit, upending the American way. As we would continue to do, right up until this very day, we squashed Cuba’s attempt at sovereignty like a bug. Our imperialism managed to wipe out Spain’s imperialism & Cuban independence in one fell swoop. This entry was posted in Blaque Book, Blaque Friday, Cuba, Diary/Cuba, In The Blaque, Novel Excerpts, Travel Stories and tagged cuba, history, sylver blaque, travel by Sylver Blaque. Bookmark the permalink. Once again a great post. And like always, much more interesting and probably more truthful than a history book! I’m so glad you enjoyed it! 🙂 Yes, history we should be learning here, but aren’t, is both shocking & fascinating. And enlightening! Brilliant post. We Brits still have trouble getting over the fact that we’re no longer in a position to exercise our brutal imperialist ambitions directly. Nowadays we just follow along happily with you guys! The Bush/Blair ‘special relationship’ was ridiculed by the British press at the time who loved to portray Tony Blair as Dubya’s pet poodle! You’ve highlighted a really interesting topic for me here as I previously knew nothing of Cuban history. Great job as always, Sylver! I loved the Teddy Roosevelt quote and your discussion of the Platt Amendment helped me better understand something that has thus far escaped me: how-in-the-hell did we manage to come by “Gitmo?” I never was able to figure how we got it and how we keep it. Again, great job on the series! Thank you, George. Yes, the “forever” Platt codicil is what allows us to continue to operate Gitmo in Cuba. Even Castro’s sweeping nationalization on the island could not stand up to Platt! and it saddens me that the US is not alone in this…every country has in some point in its history exhibited such cruel behavior. India has been doing similar things with its neighbors, Nepal, Bangladesh and Sri Lanka. Its one case where what the government does is not a reflection of what the people want. You’ve presented a relevant subject in a beautiful yet simplistic manner. Love that! Political hypocrisy – you’ve nailed it!